IRVINE, CA (July 12, 2014)- Brad Stisser came to the fore with possibly the goal of the season as Arizona United defeated the Orange County Blues 2-1 at Anteater Stadium, on the campus of UC Irvine. In the 37th minute Schillo Tshuma sent a delicious cross to the far post, over the head of Seth Moses. Stisser was lurking behind the Blues defender and thundered a first time volley into the far post. Tshuma and new signing Long Tan ran the Orange County Blues defense ragged, creating chance after chance. Tan had plenty of chances to score on his debut while Tshuma was unlucky to see his second-half effort rattle off the post. Any fear of the Blues taking advantage of United’s missed opportunities were laid to rest in the 74th minute as substitute Jon Okafor headed home Arizona’s first corner kick of the match. 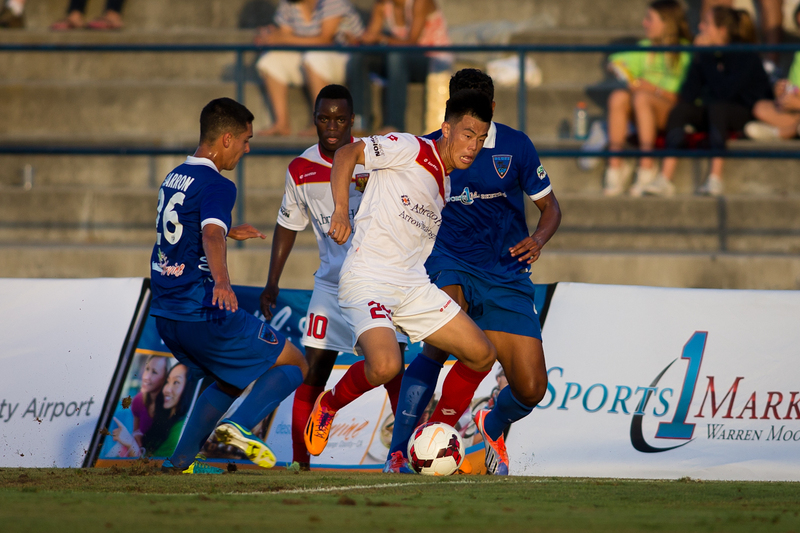 The Blues would make a game of it as Enrique Cardenas scored his first professional goal just three minutes later. Cesar Rivera played a quick free kick into Cardenas who turned London Woodberry brilliantly before smashing the ball into the net. Orange County pressed for a winner, but Arizona stood strong, making sure there was no repeat of their breakdown in Peoria on June 28th. With the win, Arizona claimed its first road win since May 10th and snapped a four game winless streak taking all three points for the first time since June 14th. The Blues fall to 8-10 on the season with its second straight defeat and is in danger of falling out of playoff position. The two teams will meet for the fourth and final time this season in Peoria next Saturday. Orange County Blues fans can win a trip to travel with the team to Arizona. All you have to do is go to www.ocbluesfc.com and sign up for a chance to win the professional soccer player’s experiencce. The next home match for Orange County is July 26th, against SoCal rival LA Galaxy II. Join them at Anteater Stadium by calling (714) 738-8011 or email seats@bluessoccerclub.com.